Last Saturday, I attended the reopening of the Alice Wylie Reserve in Mt Albert. This park can be found at the corner of New North Road (right side of image above), and Burch Street. It was declared a reserve in 1980, and formally taken over by the Mt Albert City Council in 1982, the year the council named it after Alice Wylie, then a sitting member. Personally, they couldn't have honoured a nicer person than Mrs Wylie, who always has a smile and a warm clasp of the hand when she meets me. The early 1980s setting out of the park resulted in this recessed bus stop, one of my favourites in the city -- and thankfully, not painted over yet with hideous grey anti-graffiti tag-out paint. Long may it stay that way. The gates aren't original. The first ones here were removed recently. Beyond the gates, the park itself. A tad gloomy on the westward side, and this was a fairly bright July morning. The installation of this interpretive sign hadn't been long completed. The groundsman, a nice chap, came along shortly afterward and cleaned everything up. Very nice design, having a timeline history of the park instead of short paragraphs around themes and such. I did research work on this -- and I must say, I was impressed with how they presented the information. The new Auckland Council are certainly earning their marks when it comes to such signage around the city. ... was the main building used as an industrial school (1900-1917) and a little later as a school hostel for Mt Albert Grammar (1927-1971). The circular path in front has been retained. 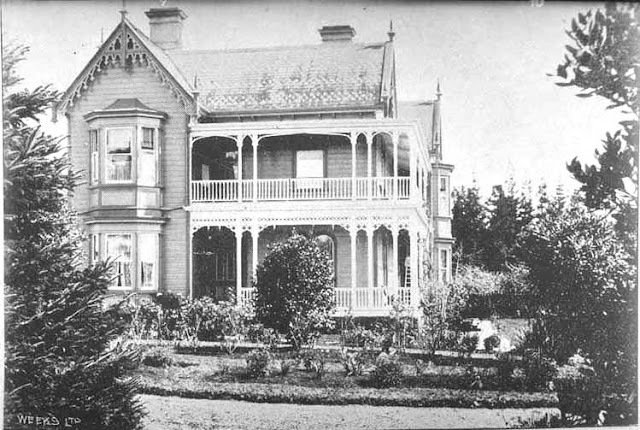 The house was built for solicitor John Macky Alexander, a gentleman’s residence of 16 rooms with 6 acres of what was later advertised as rich volcanic land bounded by New North Road, Burch Street, and Asquith Ave, 4½ acres in paddocks and the remainder “tastefully laid out in gardens, shrubbery, and orchard”. He died suddenly in 1892. Charles Henry and Florence Isobel Wilks bought the property. Charles Wilks was a partner from 1895 with E H Potter in the firm Tanfield, Potter & Co, crockery merchants. In March 1900, the Wilks family sold the property to the Crown for £1600, so that the Auckland Industrial School could be transferred from Parnell to Mt Albert. There are two small memorials here. Close to the centre of the park, this sign for the sculpture Statue of a Cloaked Woman, by Christine Hellyer (1995). For something supposed to be prominent, I couldn't for the life of me see where it was. So I asked the groundsman, who pointed it out -- in the midst of one of the rock gardens. They've just done some lovely replanting here -- and you have to go over that to see the sculpture and read the plaque. No paths to this artwork. For me, though, the trees are a work of art. The owner of the bike did kindly hold off resting his conveyance against the tree until I got the shot. Very nice of him (thanks). I knew there was another part to the park's story nearby, so headed off toward Burch Street. This is looking back in the direction of the Alice Wylie Reserve. Turning around, you'll see this. According to the Mt Albert Historical Society. both the industrial school's matron Miss Sarah Jackson in 1901 and 1911, and later Sir Algernon Thomas for the Mt Albert Grammar's hostel in 1937, are said to have planted coronation oaks hereabouts. There are also supposed to be two commemorative plaques at this small reserve. If there is such a plaque beneath this tree, the ivy hides it well. The other oak has its plaque -- behind the tree. The plaque simply says the oaks were planted for the coronations of Edward VIII, George V and George VI. Back to the re-opening ceremony. Prior to the formalities getting underway, the crowd were entertained by a string quartet, and had the promise of a dainty high tea at the conclusion. The day, though, belonged to Alice Wylie. Alice Wylie was the Mt Albert representative on the Auckland Institute and Museum Council for the entire period I was Director I think, in the 1980s and 1990s. She was a warm and friendly person who took a keen interest in everything, and was also as sharp as a tack when it came to the interests of the Museum and of her ratepayers. I haven't seen her since I left in 1993, so I'm delighted to see she continues to flourish, and that her Reserve has been refurbished. Do give her my regards next time you see her. I visited the park today having been told of the revamp by Auckland Council archives - where I was researching the Auckland Industrial School using the same files you had used. Miss Sarah Elizabeth Jackson was my grandfather's aunt and I have researched her life and spoken to Mt Albert history society. I am pleased that the history is well presented and feel that that the link with the industrial school is now visible as the 'doorstep' plaque only mentions the MAGS days. I think I was there at your talk, Squarequilter. Very well done.